A Christian organization combining Reformed theology and Gospel-centered faith, “TGC Korea,” has been inaugurated. It serves as the Korean branch of The Gospel Coalition, TGC, established in 2005 by the Revs. D.A. Carson, Rev. Tim Keller and other U.S. evangelical leaders. 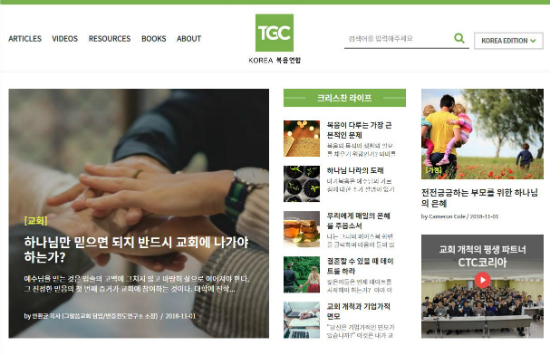 TGC is formally opening its Korean-language site (tgckorea.org) on November 8. It plans to translate and provide reading materials such as lectures, sermons, conversations, essays and commentaries from the U.S. TGC site, as well as videos. The U.S. TGC site, which holds more than 300,000 content-items, records an annual 20 million visitors and 100 million views. In addition to its U.S., Canada and Australia sites, it now offers versions in Spanish, French, Italian, Chinese and Arabic. TGC Korea also plans to translate into Korean and provide materials from five sites representing U.S. Reformed faith. It has received official permission to use “Desiring God” (John Piper), “Ligonier” (R.C. Sproul), “9Marks” (Mark Dever) and “Unlimited Grace” (Bryan Chapell). On November 1, TGC Korea held its first board meeting, where it selected Rev. Park Eun-jo of Eunhye Saemmul Church as the first board chairperson, and Rev. Stephen Eom, vice-president of TGC in the U.S. and pastor of Boston Citylife Presbyterian Church, as a special board member.